Finding your perfect shoe size is difficult even in today's standardized world. 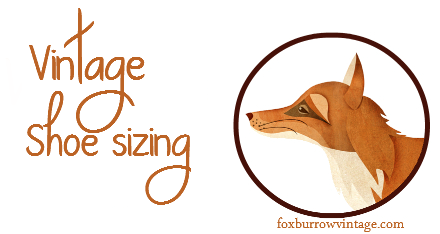 Luckily for us, vintage shoe sizes aren't much different from modern shoe sizes! If anything, they are more particularly made to fit specific types of feet - which is great if you know your ideal size! The first thing you want to do is figure out your measurements and determine your shoe size. To do this you want to take a piece of paper and trace the outline of your foot. Then take a ruler and measure from the tip of your big toe to the back of your heel. That is your foot length. Then you will want to take the ruler and place it across the ball of your foot, which is taken at a slight angle from the widest part of your foot to just below the pinky toe. Lastly, you will want to measure your instep, which is the narrowest part of the middle of your foot. Record those measurements and keep them with you when shopping for vintage shoes. Now that you know your basic measurements, you can find your ideal shoe size. It may be quite different than you expect. For example, you may be used to wearing a 7.5, but find that your foot length is only a size 6 foot length with a 7.5 average width. In that case a modern 7 or 7.5 is probably the shoe size you wear every day, but a 6.5C or 6.5W (wide size) is likely your accurate size. Here is a shoe sizing chart that will help you find your accurate size based on your measurements. Now that you have a general idea of your ideal shoe size, let's discuss how to shop for vintage shoes. Vintage shoes come in an array of sizes. There are two different sets of "lettering" that help determine the width. The first set of lettering is A to D. AAAAA is the narrowest shoe size, and D is the widest, with B being regular width. Next is the abbreviation set of lettering. S standing for Slim, N standing for Narrow, M standing for Medium/Normal Width and W standing for Wide. 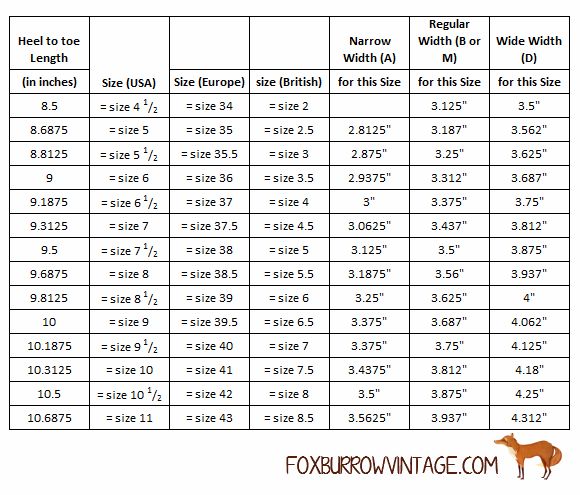 Since most vintage shops (including Foxburrow Vintage) record their vintage shoe sizing by the measurements on the outside of the shoe, the best thing is to find a very comfortable pair of your own shoes and measure the ball of the foot and the length of the shoe on the sole. It's important to make sure you are not measuring a different TYPE of shoe. So if you are shopping heels, make sure to measure a comfortable pair of heels with the same heel height and not your pair of sneakers. This way, you are guaranteed a nice fit. Just like modern shoe companies vary and you may wear a size 9 sneaker and a size 8.5 heel, vintage shoe companies were the same. It's very important to choose your shoes based on measurements, but knowing your general shoe range will help you narrow down your searches online. It is interesting to note that all humans are created so individually that there is hardly anyone who is the same as another. Even twins or triplets are individual characters with their own distinct differences albeit small ones; the same with shoe sizes.I find a website for the Wide Width Sandals for Women you can visit this site. Before you start a walking program, get comfortable walking shoes! A good pair of walking shoes will give you maximum control and superior comfort. If your shoes are not comfortable, you will not want to continue your walking program.I find this website for Best Shoes for Standing All Day. This stuff works great! The color of the tape closely matches my normal skin color so I can wear the tape exposed and it isn't that noticeable. The tape stays on for a long time and flexes even treadmill running shoes.